This blog post has been written by our friend Gretchen George. We are really grateful to God for her! 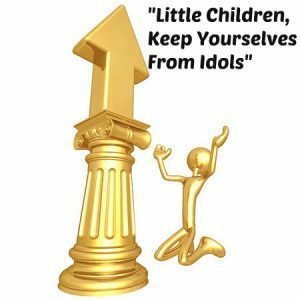 In reading through the book of Jeremiah recently, my thoughts kept returning to John’s final words to those to whom he was writing in 1 John, “Little children, keep yourselves from idols.” It’s doubtful that those in his intended audience had wooden statues or metal images set up in their homes. Most of us don’t either. So, why the warning? Jeremiah was called by God to warn his people of impending judgment because of their hard hearts towards him. Like those who came before and after him, Jeremiah implored the people to return to the Lord. Not only did they turn a deaf ear to Jeremiah’s warnings, they even tried to kill him. Surely we would never respond like that! A closer look, however, offers some insight into God’s heart and into John’s warning in 1 John. In Jeremiah 2:2 the Lord says, “…I remember the devotion of your youth, your love as a bride…” and 2:4, “What wrong did your fathers find in me that they went far from me and went after worthlessness, and became worthless?” Here with we find the heart of God broken over the unfaithfulness of his people. The specifics of what they’re worshiping are not at issue. What matters is the fact that they’ve gone after something other than God. It’s about what their hearts love. God says, “Surely, as a treacherous wife leaves her husband, so have you been treacherous to me…” (Jeremiah 3:20). Yet we know that not all of the things which draw our hearts away from the Lord are bad in themselves. Our friends, our work, our hobbies—to name only a few—are not inherently evil. However, when we love those things more than we love God, they become idols in our hearts. As my children were growing up, I would periodically ask them, “What do you think I value?” I wanted to know whether what I thought I was modeling and teaching them, particularly about the place of the Lord in my life, was actually evident. I recall one time when I asked this question, my daughter replied, “Sleep!” That certainly left me with something to ponder! It is helpful for all of us, I think, to have those in our lives who will answer those kinds of questions truthfully. Are there areas where our hearts are being drawn away from our precious Husband, Jesus? Are there things we love more than we love him? As we consider John’s admonition to keep ourselves from idols, David’s prayer in Psalm 27:4 is particularly meaningful, “One thing have I asked of the LORD, that will I seek after: that I may dwell in the house of the LORD all the days of my life, to gaze upon the beauty of the LORD and to inquire in his temple.” For when we see his stunning beauty, his infinite love, and his gracious care, our hearts will again be won to him. May David’s prayer be ours as well.